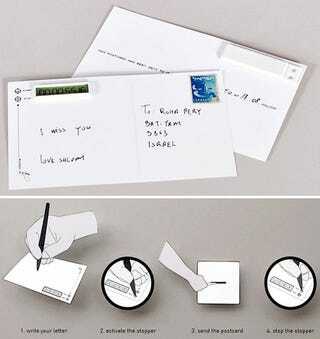 Just how long does it take that postcard to get from A to B? The Stopper postcard can tell you, all while adding yet another layer of stress onto the backs of today's postal workers. Sure, it's a somewhat interesting little novelty item to us, but to the postman it's a constant reminder of just how behind he is on his route. It also kind of looks like a small incendiary device with a timer. Good thing it's counting up.